Finally, I return to tell you about another experience in my life here at the southern tip of Africa. For me, the event is one of the 'thin threads' that Stacey Battat, former broadcast journalist, writes about in her book with the same title - it was life-changing. It happened on a sunny Sunday afternoon in South Africa with the mountain ridge bright against the blue sky of Cape Town. I have gotten myself into the habit of driving along the coastline past the beautiful naval village Simon's Town up to Cape Point and back home to Kommetjie. Usually, this would be "me time", but a very dear spirited and spiritual friend invited me to share a picnic and we set out on the trip. I treat baboons with the utmost respect, and NEVER feed them - unlike some uneducated tourists that would "like to get the perfect picture" and then lure the baboons closer to their vehicles with fast food or fruit. 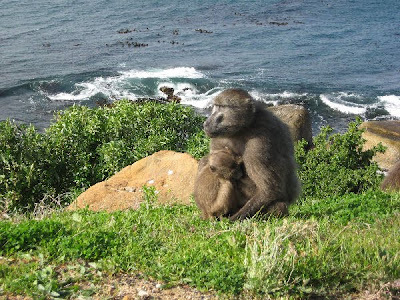 Doing so, was an accident waiting to happen - and it did: Big Manie (my name for the baboon) stormed to the car, yanked the door open and went directly for my small-framed friend's face where she still sat buckled up in the driver's seat. She had the clarity of mind to grab him at the throat and push back and at the same time, I fell across her to try and get her door closed again. 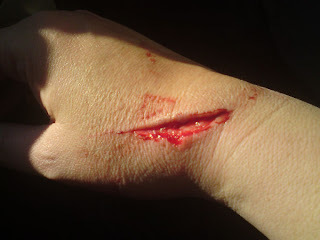 We managed, but before we could shut it, he opened it again and lashed out at my arm - leaving red scratches with his nail and one cut with a very dirty nail deep enough to see the bone of my hand under the bleeding flesh. This wound would later become infected despite best efforts and is still not 100% what it used to be. (Sounds a bit like a bit of fictional horror when I try and describe the moment of sheer angst). Johannesburg-based Karen Wentworth, South African representative of the International Primate and Exotic Animal Association, said the problems people were experiencing with baboons were self-inflicted. "A lot of the problems come from people feeding the primates. They (primates) will take food wherever they can get it, and will go back to that place for more," she said. "They become less afraid of humans and it lessens their wildness, which is when they cause problems." Cape Nature baboon management team head Melikhaya Pantsi said it was important for people to be cautious when dealing with baboons. "It is very rare that a baboon would attack a human being. They might jump on you to grab what they think is food, but they are generally not aggressive," he said. 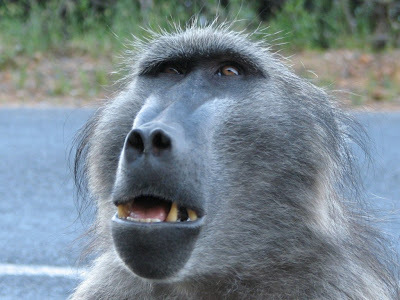 But Graeme Young, conservationist at the Ndlambe conservation department in Port Alfred, said it was not unheard of for baboons to attack humans without provocation. Sometimes older males were kicked out of their troop and became aggressive towards humans as they scavenged for food on their own, he said. "We've had reports of an old male baboon that has spent up to three weeks a year disturbing residents in Port Alfred - running through gardens and rummaging through rubbish bins." 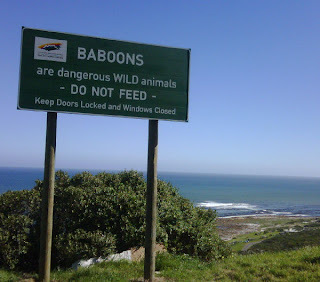 Jenny Trethowan, of Cape Town-based baboon monitoring project Baboon Matters, said attacks on humans were usually not the fault of the baboon. "When you unpack the attack, usually the person has done something wrong." We drove to the hospital that Sunday in July and I cried - and of all the things I were thinking at the time, I was deeply saddened and worried that the joy I get from observing baboons would be forever replaced by fear. I was also angry, because I knew that this baboon was mistreated by humans before - there was no respect left towards the two humans in the car that invaded his space. Did we do something wrong? No, not in person. (Except for not locking the doors, but assuming we are safe with CLOSED doors and windows). Did we do something wrong as human beings - collectively? All the time. "We have a year’s worth of data for the Smitswinkel troop. Prior to the intervention, the troop was spending 25% of the time in Simon’s Town, raiding the urban areas regularly. As the home range is a linear area, the situation enabled a unique strategy. A virtual line was drawn and the baboons were to be kept south of this line. A range of tactics were used including bear bangers and bull whips and since the 3 June 09 the baboons have not been back into Simon’s Town. It is important to note how effective the GPS collars are working as the monitors can assess how to employ resources most effectively to keep the baboons out of the urban area". 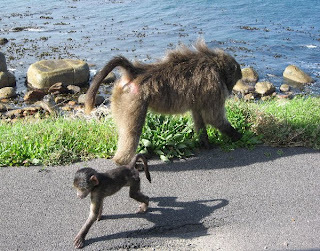 I am no expert, but I am left to wonder: Did the 'pilot' banging on metal and use of whips in Simon's Town (by people) drive baboons away from the residential areas since June 2009? And did it leave them traumatised? further up the road? So when we met them a month later in July, there was a deeply-rooted bitterness against humans, which I have never encountered before in the South Peninisula. And still we have some people feeding these beautiful and fragile baboons from cars along the road... It MUST be confusing to them. Are humans driving baboons insane by acting so inconsistent? On the one hand, chasing away and with the other hand feeding. Then rather bring back monitors that walk with baboons and bond with them, and understand these stunning animals. Monitors that educate humans and not vice versa. We ARE in fact in THEIR space, and should act accordingly in my humble opinion. We all need to get this right. And soon. I can live with the slight nerve damage and subsequent pain in my little finger which surfaced only last week as the wound healed inside. I can also live with the scar at the top of my hand which may need a bit of plastic surgery one day. I will battle to accept it if a child or unsuspecting tourist gets seriously hurt over at Simon's Town by this troop. We drove past the same place two week ago - and children were running outside (!!) a few metres from the baboons grazing on plastic bags filled with KFC left-overs. No monitors in sight. So please, this is a very personal appeal: GET this. 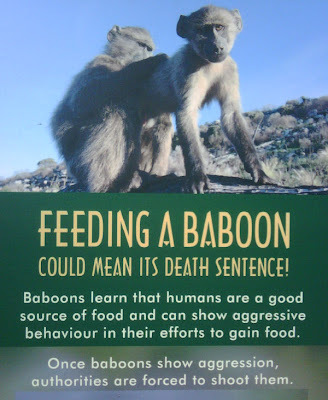 Please do not confuse baboons and sign their death sentence - or that of a human being observing them innocently - by feeding them or making them aggressive. Let them find their food naturally in the beautiful mountains of Cape Town and lead them away from human dwellings with ethical ways. I continue to love baboons, and my respect for them as truly wild animals has only grown due to this incident. 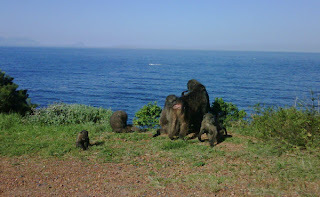 Like the blogger, AfricanPenguin, I wish to also share facts about the Chacma Baboons that frequent our world. The agencies working with baboons here made various information posters - like this one outside the Kommetjie Supermarket. The Kommetjie Primary School also completed a nice educational project (website) on understanding and dealing with baboons. Years later, he wrote in a letter, “No other worker in the field ever had the opportunities I had of studying primates under perfectly natural conditions. In other countries, you are lucky if you catch a glimpse of the same troop twice in a day. I lived among a troop of wild baboons for three years. “I followed them on their daily excursions; slept among them; fed them night and morning on mealies (corn); learned to know each one individually; taught them to trust and to love me – and also, to hate me so vehemently that my life was several times in danger. So uncertain was their affection that I had always to go armed with a Mauser automatic under the left armpit like the American gangster! “But I learned the innermost secrets of their lives. You will be surprised to learn of the dim and remote regions of the mind into which it led me. I think I discovered the real place in nature of the hypnotic condition in the lower animals and men. I have an entirely new explanation of the so-called subconscious mind and the reason for its survival in man.